Output from a machine processing EPS in Toronto. 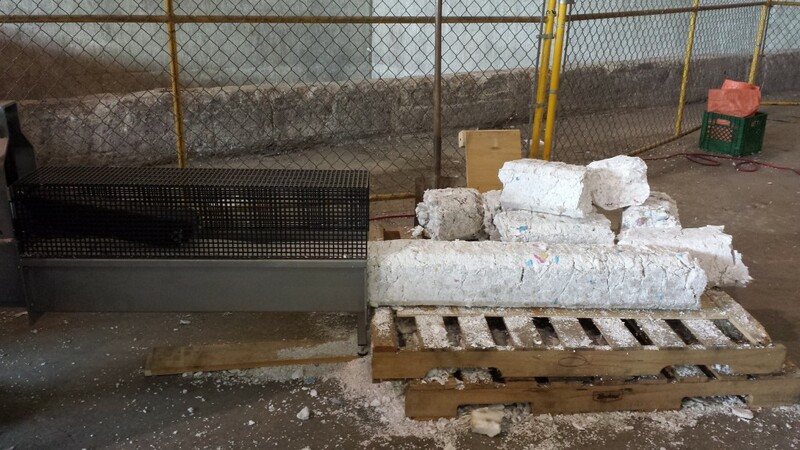 The Continuous Improvement Fund (CIF), with help from the Canadian Plastics Industry Association (CPIA), recently funded a pilot project in Toronto to evaluate the densification and marketing of curbside collected Expanded Polystyrene (EPS), commonly referred to by the trade-name Styrofoam. Support for this pilot project builds on previous CIF efforts to identify and overcome barriers to EPS recycling in Ontario. The City of Toronto currently accepts EPS as part of its curbside cart-based collection program. This latest pilot project is focused on EPS placed in plastics bags and manually recovered at Canada Fibre's Arrow Road MRF. At the facility, plastic bags of EPS are normally emptied into an MRF bunker, but for the purposes of this pilot, bags were hauled to Toronto's Dufferin Facility for densification using a RUNI SK200 densifier. Following further sorting at the Dufferin Facility, nine pallets of densified EPS bricks (or blocks of densified EPS) were processed over an eight-day period. A total of 1,750 kg of EPS was densified, with each pallet containing approximately 200 kg of EPS bricks. After distribution of the densified EPS to potential re-processors for evaluation, no viable domestic market could be established for either the densified EPS, or standard baled material, at the existing quality. Another CIF Project, completed in 2014, concluded that the net cost to collect EPS curbside in urban centres ranged from $1,500 to $2,800 per tonne. Findings from this new densification pilot project supported the 2014 project conclusions.According to the CPIA, they have been assisting the City of Toronto over the last year by arranging for re-processing of EPS at a facility in Indiana on an as-needed basis. There there is not currently a sales contract in place for acceptance of baled or densified EPS. At the end of this latest pilot project, a proposal was received by Toronto to accept baled EPS at a competitive cost per tonne. However, the proposal included possible energy-from-waste utilization and the city declined the offer. While various efforts continue across Canada to seek cost-effective ways to collect and re-process EPS and create a sustainable end market, after almost 30 years, no consistent, reliable and cost-effective option appears to exist for curbside-collected EPS. Some Ontario municipalities continue to accept white EPS at depots. This alternative approach eliminates curbside collection and MRF processing costs, which can exceed $1,000 per tonne to manage. Even with no collection or MRF processing costs, the hauling costs from depots and fees charged to accept EPS by re-processors are substantial and not feasible for many municipalities. An exception is in the Town of Markham, which has been successful in securing a domestic market (to replace previous export) for its densified depot-collected EPS. According to the CIF, despite tremendous effort by industry and municipalities over the past decade, EPS recycling remains challenging both operationally and financially. Costs have remained high and markets uncertain. However, post-use EPS remains a product with some significant global demand, for products including building insulation panels and extruded mouldings, in the U.S., Spain and Asian markets, provided strict quality criteria are met. An October 2017 report by More Recycling indicates that the demand for Post-Consumer Resin (PCR) foam polystyrene exceeds supply by some 233 percent. Capacity to purchase PCR carries the provision that "price and quality specifications" must be achieved to access the markets. It is this provision that municipalities should weigh carefully before adding EPS to their program, according to CIF. The cost and feasibility of recycling PCR differs dramatically from that of clean post-industrial material and may prove to be prohibitively expensive or impractical for many municipalities to achieve. With uncertainty surrounding the timing and final material composition of Blue Box Programs under varying individual producer responsibility plans, municipalities in Ontario and around Canada must carefully consider their approach to EPS recycling based on waste diversion goals and individual community economics. In the meantime, the CIF says the polystyrene industry, through the CIF and the CPIA, is able to assist Ontario municipalities facing challenges marketing their materials. Resources relating to current quality specifications are available online at www.plasticsrecycling.org. This article was originally published as a blog by the Continuous Improvement Fund (CIF), and was adapted for publication in the September, 2018 edition of Recycling Product News, Volume 26, Number 6.